Before I tell you about Egg Fu Yung, I have a story with a – ahem – moral lesson to share. Dinner prep started late today, fortunately I had planned to make simple dishes. So there I was busy at the stove, handling more than one thing at a time and feeling quite proud that I could put food together so fast. I was frying some enoki mushroom pancakes and also started filling a pot with water for the vegetables. I went back to to tend to the pancakes and promptly forgot about the pot. Then there was a sound of water… the pot was on the countertop and water was overflowing on to the countertop and down to the floor, yikes! I yelled for hubby, who happened to be home early that day, for help. If not for him, that accident would have set me back 15 minutes and all the quick prepping and cooking would have been for nought. “Pride comes before a fall” leaped to my mind! 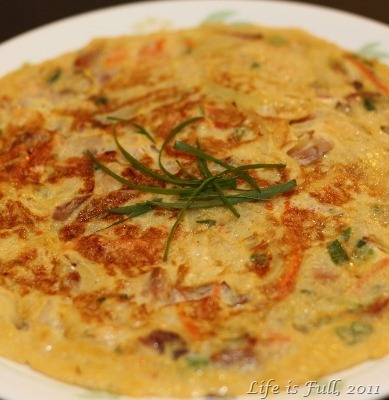 Back to the Egg Fu Yung, it is a Chinese omelette that has a filling of meat and/or seafood and vegetables. I only came to know of this dish when I was in my late teens when my dad would order it at Chinese restaurants. So now this dish reminds me of him! Egg Fu Fung is usually deep fried in restaurants but I did a pan-fry version at home. It is savoury and tasty with the BBQ pork and shrimp while the onions lend a sweet crunch. 1. Combine all ingredients and seasoning in a medium bowl and mix well. 2. Heat oil in pan or wok, pour in the mixture and cook over low heat until the egg is set. Turn it over and continue to cook until the bottom is golden brown. Dish up and serve. 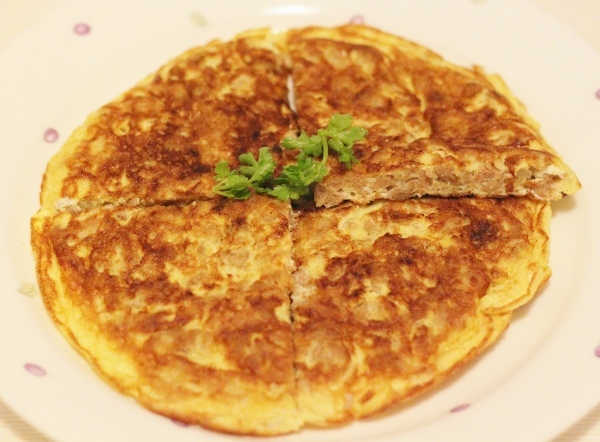 This week’s FFwD recipe is an egg omelet from the region of Basque in France. 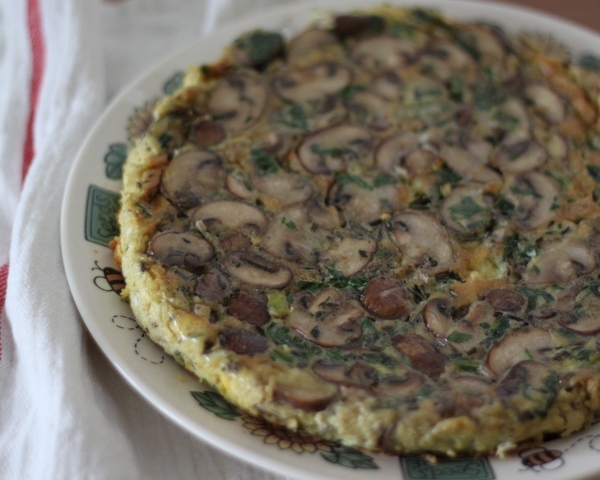 The ‘original’ recipe is a potato tortilla but I chose one of the variations offered by Dorie and made a mushroom version. Half a pound of Baby Bella or cremini mushrooms were cooked with spring onion and garlic with the addition of chopped parsley, thyme and rosemary. The mushrooms were then stir into nine beaten eggs for the omelet. 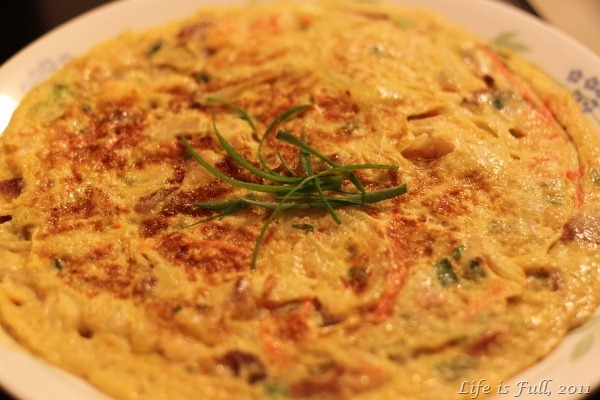 The omelet mixture is first cooked in a skillet before going under a broiler for a minute to finish. The result was a delicious omelet. 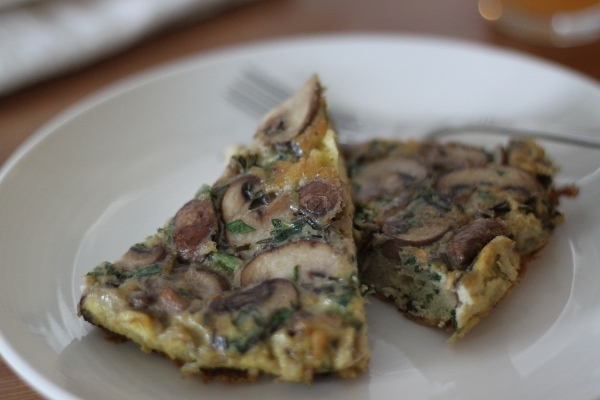 The herbs complemented the mushroom very nicely and the omelet wasn’t dry. I found it needed a little something though and some Frank’s RedHot sauce took care of that. 🙂 This was supposed to make 4 lunch main-course servings but it was gone quickly between 3 adults. Maybe it would have fed four if I had served a salad too. This was a simple and quick dish to make. From start to end I took about 50 minutes. I might try the ham, egg and potato version next time. I cooked the omelet in my stainless steel 10-inch skillet and it turned out on the flat side, not even an inch high. One tip about handling a skillet that has been in the oven – don’t put your oven mitt away after you used it to remove the skillet from the oven. Instead, put it over the skillet handle i.e. insert the handle into the mitt, and leave it there. That will prevent a nasty burn and shock when you grab the hot handle by mistake – like what happened to me a few times when I wanted to move the skillet away! 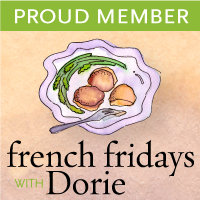 Click here to look at the tortilla other French Fridays with Dorie members made. Next week’s recipe is an Orange-Almond Tart. 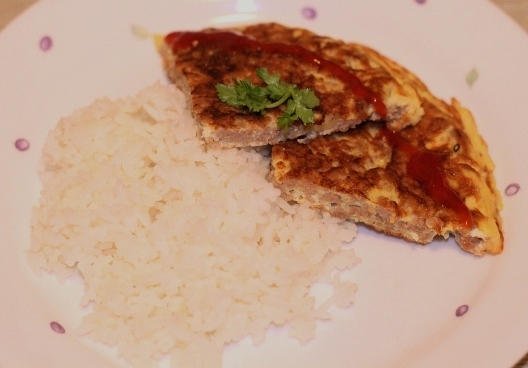 The other thing I remember about the nanny was that she cooked a delicious, and in my 8- or 9-year old mind, the best minced pork omelet ever. It was meaty and savoury and we would eat it as a sandwich, put between two slices of white bread and drizzled with ketchup. Her way of cooking it was to mix the ground meat with the beaten eggs before pouring it into the pan. I remember my mum saying she was concerned that the meat may not be fully cooked that way. So in my recreation, I will first cook the meat before adding to the eggs. Well, my memory of the omelet my nanny made did not include its actual taste so I couldn’t compare but my omelet passed the judges’ taste test with flying colours. I got “yum” and “yummy” and thumbs up signs! 1. Marinade the ground meat with the light soy sauce, oyster sauce, sesame oil and pepper for 10 minutes to half an hour. 2. Heat some oil in a frying pan and sauté the garlic and shallot until fragrant. Add in the ground meat and fry till cooked, breaking up large clumps of meat as you cook. Dish up and set aside. 3. Break the eggs into a bowl and beat, adding a trickle of light soy sauce and a dash of pepper. Pour in the cooked meat and stir to mix. 4. In a non-stick pan, heat up some oil and tip in half the egg and meat mixture. Let the omelet cook over medium-low heat until it is almost set and you can smell the aroma of fried eggs before flipping over to finish cooking the other side. 5. Repeat with the remaining egg and meat mixture. Serve immediately with dipping sauce of your choice e.g. ketchup, chilli sauce, soy sauce.